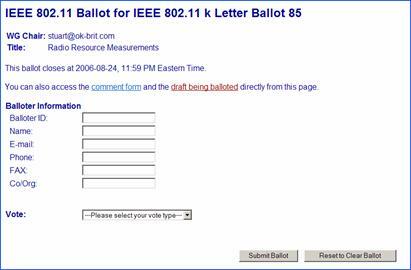 These instructions apply only for IEEE 802.11TM Letter Ballot 120 (LB120) which is a procedural vote on Draft 1.04 of the Task Group “v” amendment to the current IEEE 802.11TM standard and move it forward to Working Group Letter Ballot. This is the process we will be using to vote on letter ballots. It is a web based process similar to the process used for sponsor ballots. The ballot opens January 29, 2008 at 23:59 Eastern Time USA and closes 15 days later on February 13, 2008 at 23:59 Eastern Time USA. THIS IS A PROCEDURAL LETTER BALLOT AND NO COMMENTS FOR "NO" VOTES ARE REQUIRED.